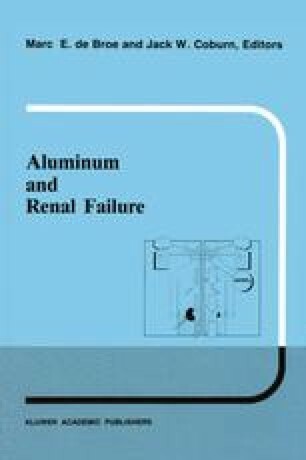 This chapter addresses the questions: What are the risk factors for aluminum toxicity? and what can be done to minimize these risks? The clinical syndromes of aluminum toxicity to be considered are: 1) encephalopathy, 2) aluminum-related bone disease (often including some degree of proximal myopathy) and 3) anemia. The relationship between aluminum loading and tissue toxicity has been most carefully evaluated in aluminum-related bone disease, and the other syndromes will be considered only when the risk factors may be different. However, even with bone disease, the definitions of aluminum toxicity have been arbitrary and criteria for its diagnosis have been vague or variable. For the purposes of this chapter, patients with bone biopsies showing significant aluminum staining (>25–30% of trabecular surface) and reduced bone formation rates (either with or without the typical features of osteomalacia) are considered to have aluminum-related bone disease . Patients with minimal or absent aluminum staining and bone formation rates that are normal or high are generally considered not to have aluminum toxicity [1–4].